If you’re like me, you’ve waited to the last minute to even think of buying Christmas gifts because you just haven’t found the time. Between birding, work (more birding), and planning future birding (CBC), you’d think I would be sick of birds, but never! Let Nemesis Bird help you with your last minute holiday gifts for the birders and outdoor enthusiasts in your life. One thing birders can never have enough of….BOOKS! A few good field guides came out this year, so I suggest these as a starting point (make sure the recipient doesn’t already own these). GULL is the word this year. Gulls Simplified: A Comparative Approach to Identification: If you didn’t know GULL is the word, this book may be for you. If you call gulls “seagulls,” this book may be for you. Or, if you are a birder that often ignores gulls because “they all look the same, ” this book may be for you. Most other gull books are extremely in depth and long, and just end up overwhelming readers. Many immature gulls share very similar plumage traits, and this book helps break those down, along with comparisons of shape and size (I LOVE the silhouette pages). While I personally think this book should be called “Gulls are Assholes,” I don’t think it would sell as many copies. Or would it? Gulls of the World: A Photographic Guide: This was Drew’s pick for a book suggestion, which shows it speaks to the more sophisticated gull connoisseurs. This book covers all species of gull in the world, so you’ll never go on a trip again where you conveniently overlook them. Thirty dollars is a small price to pay for this amount of knowledge. Birds of Chile: A Photographic Guide: This was another pick by Drew. Any new/updated bird guide for South America is a must to keep up with taxonomic changes. This book is designed for quick field identification of birds. If you’ve birded in the tropics, you know this is key, as you may only view a new species for a fraction of a second as it works it way through thick cover. If you haven’t studied your field guides before you go, you might as well just stay home. Birds of Prey of the West and Birds of Prey of the East: A Field Guide: For the raptor lover in your life, I can’t think of a better gift set than these two books together. I see this as an update to the plates in “A Field Guide to Hawks of North America: Peterson Field Guide Series” as Wheeler also illustrated those plates. There are more illustrations for each species, and subspecies commentary gives a great starting point if you want to dive into that scary world (do so with caution in field ID!). Kaufman Field Guides: While these are not new, the Kaufman Field Guide series books are essential resources for naturalists. You may be surprised to learn that birders usually don’t like *just* birds (GASP); they also typically have an appreciation for any other form of life that requires a field guide. Help them complete their Kaufman Field Guide library by filling it in with the ones they are missing. The Kaufman’s do amazing things for bird conservation, so this is a logical and easy way to support them. Bird Magazine Subscriptions are the gifts that keep on giving! You’ll want to figure out if your birder already receives these or not. Like birding books, birding magazines are a great way to stay up-to-date on birding news as the snow flies in preparation for migration and breeding season. Birds and Blooms: A subscription to Birds and Blooms is a no-brainer, at only $10 a year. The magazine features articles on how to attract birds to your yard, in addition to tips for gardening in a variety of spaces. Articles also expand on bird photography and birding hotspots to help birders increase their skill set and interest beyond the backyard. Birding magazine: The American Birding Association helps educate birders through their high-quality content, in turn increasing awareness of many issues facing birds. The ABA also provides opportunities for birding trips both within the US and abroad. A one year individual gift membership includes two magazine subscriptions, in addition to extra online content. Let’s all revel in the beauty that is the December 2018 cover art for a few moments…insert emoji with heart eyes here. Birdwatcher’s Digest: This birding magazine packs a lot of information into each article. At around $20 for 6 issues, this is well worth it for the amount of content in each magazine. The magazine features articles focusing on back yard birding and top gear choices, but many articles are a step beyond backyard birding, featuring anecdotal and educational stories from some of our most knowledgeable birders. Now that we’ve got the educational gifts aside, lets dive into the fun ones! While our favorite migrants are sipping margaritas in the tropics (that’s what they do in my head, at least), most of us are on the lookout for winter finches or rare wintering raptors. In between these ventures, it is no secret birders spend much more time at home in the winter than other seasons. Enter, crafts! These “paint-by-number” bird sets (all available on Amazon) are a good option to pass the time this winter and add a little color to your house. These all have good reviews on amazon, but make note you might want to add a magnifying glass for the user to see the tiny numbers! Also note the style of the kit you buy, either framed or unframed. Prices start at $11.99. I am partial to the Karribi kits listed here first, which are a little more abstract and untraditional. The options on Amazon are endless, so do your own search, too! Sticking with the craft theme, also check out these two affordable craft books (may be a better choice for young kids than a paint set) with paper birds you can “pop-out” of the book and assemble. I’d much rather see kids playing with these than starting at phone screens all winter long. Unique Bird Feeders: Chances are your birder already has a bird feeding station in their yard. However, they may appreciate a new feeder to spruce it up. This jelly/fruit feeder is a simple solution to providing treats for orioles, grosbeaks, and tanagers, but will have to be stored until they come back north! A few years ago, we featured a snow-man-shaped bird feeder by Perky Pet. Along those same lines, check out these cute ladybug and mushroom-shaped feeders from perky pet to add a little whimsy to a feeding station! Charley Harper Gifts: We’ve featured gifts with Charley Harper art in the past, but there are a few Charley Harper-themed gifts still out there worth noting! They are a little pricey but are a simple way to bring Charley Harper art into the home. These include: Set of 4 drinking glasses featuring Charley Harper art or Charley Harper Absorbent Stone Coaster Sets. Note that there are other themed sets of each, but I was partial to this nesting bird art stone set. The “Owl Pals” set is pretty adorable, too. Bird-friendly Coffee: If your birder is caffeine-driven, its likely they appreciate Bird Friendly coffee (and so should you!). Bird Friendly coffee is fair-trade, organic, AND shade-grown, and helps birds by upholding habitat and canopy structure within coffee plantations. I’m currently reviewing a few different kinds of Bird Friendly coffee from this list (see future post! ), but any option here would make a great gift for a birder or conservationist. Photo Equipment for Backyard Birding: While you should stay awayfrom buying high end photo equipment as a gift (unless you’re rich and very giving), Bird Photo Booth may be a good choice if you know a casual back yard birder that wants to document their feeder birds in a very adorable way. Make sure to check out their facebook page, where users post helpful tips and work-arounds for the equipment. Use code “blackswan” at checkout for $80 off your order. Here are a few photos taken by my mom in her backyard in PA using Bird Photo Booth. SPOT Tracking Device: If your birder spends an excessive amount of time alone or in remote areas, (or just “missing”), a SPOT tracking device may be a good idea. While the subscription service is a little pricey, I’m not sure you can put a dollar amount on the piece-of-mind that this device brings. I travel alone for work a lot and I know that help is a simple push of a button away, if I ever need it. It features an “S.O.S.” button that sends emergency services to your exact location, check-in buttons that generate an “I’m OK” email, and multiple buttons for customized messages while away. It appears to be on sale right now, so score! Zippo Hand Warmers: I purchased a set of these last winter and tried them out this fall at the Cut Bank, Montana hawk watch site. While it wasn’t terribly cold out yet, I was a BIG fan of having a toasty source of heat in my pockets. I placed them in the pockets of my inner fleece layer and they were able to breathe and keep my core warm. I think they would struggle to help keep you warm under 20 degrees, but they may be good for early and late winter seasons. I admit keeping a small container of lighter fluid on your person is a bit odd, but keep in mind they run on a flame-less catalytic burner, and I did NOT catch on fire while using them (I can’t find any reviews where that happened, either, so rest-assured). This burner can last a few years, and is replaceable. I initially looked into these to replace “hot hands” plastic hand-warmers to reduce waste, and I think in practice, they are a good solution. These may be a good choice for the more gadget-oriented birder. A good way to make a gift donation is to chose a gift that benefits conservation, and there are a number of critically endangered birds in Hawaii. I can’t imagine a single birder who wouldn’t love this seabird buff, knowing that 25% of the proceeds go to seabird recovery in Hawaii, and 10% go to the Cascadia Research Collective. Another option is the Puaiohi T-shirt; a portion of the profits go to the Kauai Forest Bird Recovery Project to save Puaiohi through rodent control and conservation research (note the shirt ships after January 1st). And I leave you with…the most adorable plushie gift set I have ever seen in my life. Collecting stuffed animals is a phase I never grew out of. These ones are beautifully and realistically made, and can be bought as a set (adult and chick) with a book and DVD for only $40. I emailed the creator of these works of art, and she informed me that she donates money primarily to Kauaʻi Albatross Network as well as other organizations that benefit birds. She also donates books and stuffies to local schools because she understands the importance of instilling a love of nature in children. I don’t think I could leave you on a more heart-warming note than that for this holiday season. 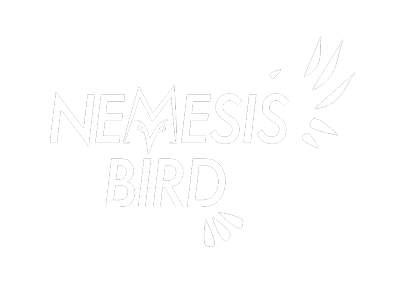 Happy holidays from the Nemesis Bird Team!